So boys wearing pink you say? Absolutely! Our society has been plagued by what we perceive as "normal" and we use it as a shield to hurt and judge others. It is unacceptable! It is just plain wrong! And the worst part of it all??? We are teaching our children to have these judgmental values. 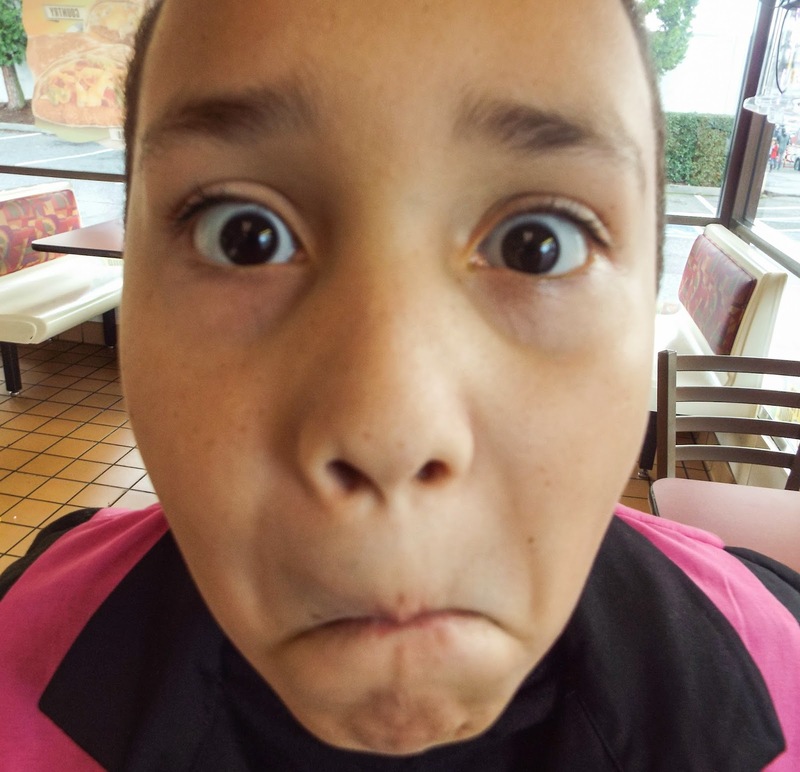 Ask an average teenage boy if he likes pink and his instant reaction is one of disgust. The color pink is a color like any other and does not belong to girls alone. 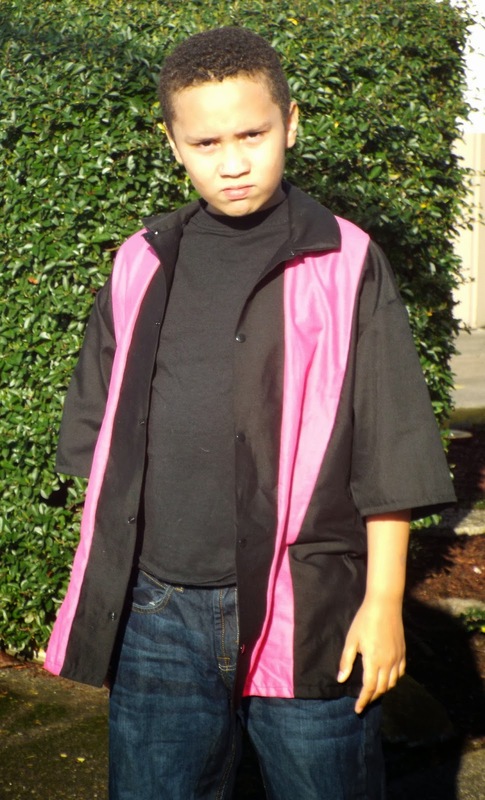 Now my son is a preteen so he was super concerned that wearing pink would make him a target for ridicule. I told him he could just model it for the blog tour and then he could put it in the closet. But then I let him help me with the design, I let him sew a little. He even put on his own snaps. And now? He loves it!!! Enough of my soap box, let's get to my creation. My son is huge! I have a lot of trouble finding patterns that will fit him and hopefully for more than a day. So when Scientific Seamstress released the adult version of their bowling shirt, I snatched my copy up the first day. And then stored it in the pattern abyss and never looked back. But I should have and I intend to make many, many more. I ended up making him the XS which gave him plenty of room to grow and allows him to look as cool as he thinks he is. First off, I love this pattern! And the fact that to make the fun striped look didn't require any math on my part. The pattern comes with complete instructions and measurements to make horizontal or vertical stripes. And I was able to sew up two of them in a few hours. Even after all of the hard work, he was still concerned about wearing his shirt in public. And admittedly, his stepdad wasn't much help. Until I explained to him, how hurtful making fun of people is. And we will accidentally raise our children to think it is okay to hurt people. 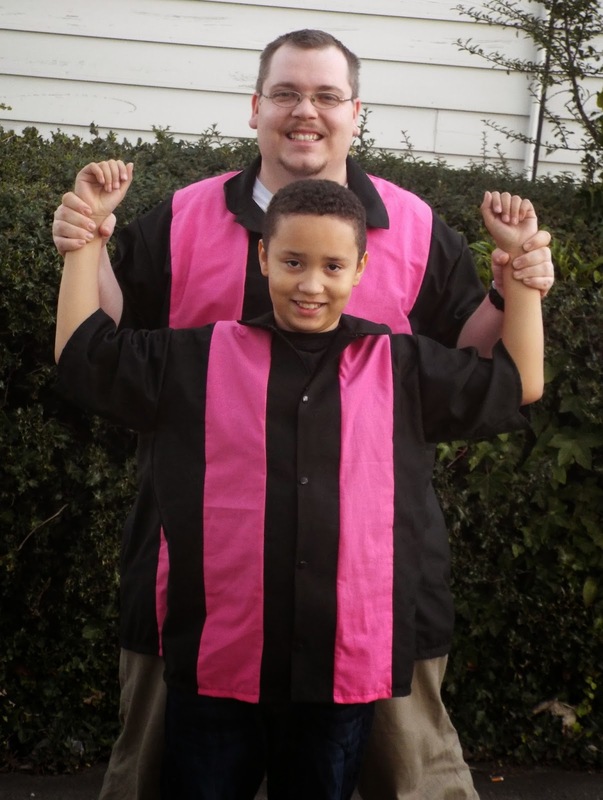 Silly men eventually see the light... so to support my son and boys/men who wear pink everywhere, he wore a pink shirt too! 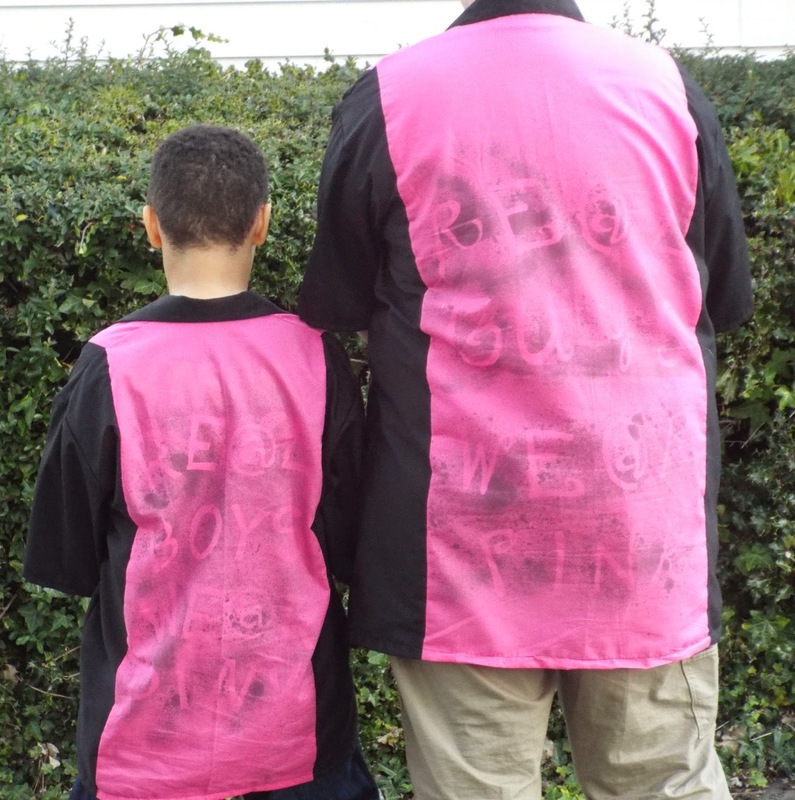 Then they decided to state their love for pink with some fun fabric spray paints. In retrospect, I would have made it darker and therefore easier to photograph but in real life, the effect is more like graffiti which they love! So to reward my strong son we went out to lunch. I offered to let him change his shirt first but as you can see, he decided that wearing it was much cooler! Moral of the story: Boys look good in pink! And they can love it too. So enough of wandering the fabric stores looking for navy blues, greens, grays and blacks. 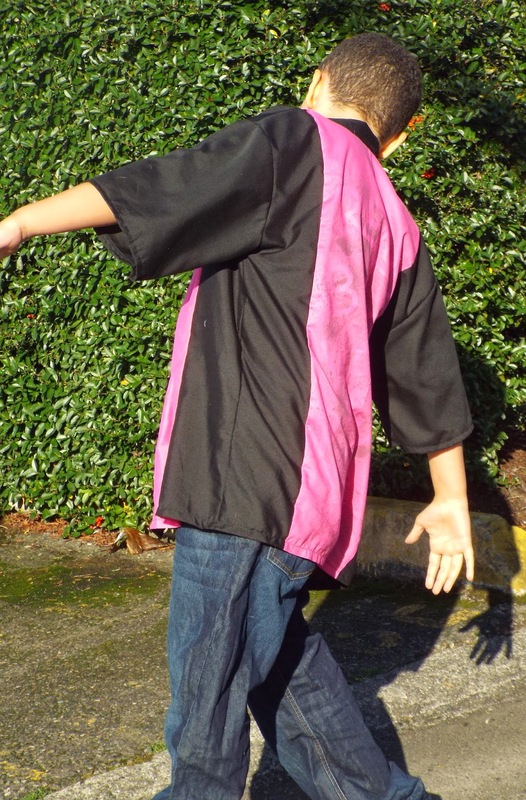 Grab some pink and sew something up for your boys, even your big boys! 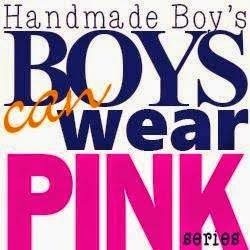 And then head over to the Sew For Boys facebook group and show it off! Or post it with the hashtag #boyscanwearpink. WAIT!!! Before you go, enter to win prizes from our amazing sponsors! And check back with me later this month for my Boys Wear Pink Volume 2!!!! These look amazing!! Thanks for sewing for the series! Thank you for having this amazing series! I love that they're in matching shirts. Support from the male rolemodels in our little guys' lives is so important and it's awesome that he took this step too. Great job! I agree Katy! It starts with us adults. wow! You rocked it and so do they! Thank you Joey! This is the first wearable item I have made for my husband. These look awesome! I'd love to sew something pink for my little guy! They look great!! Love that they both wore them. 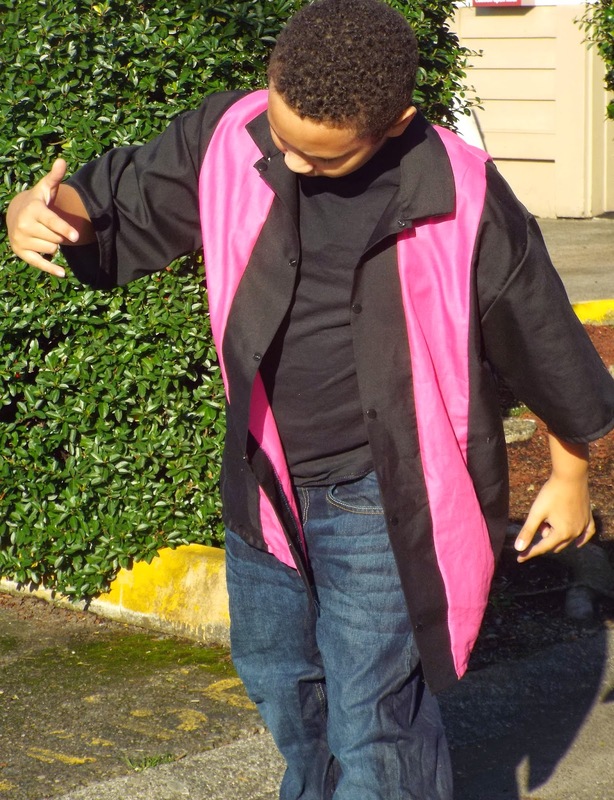 I love pink shirts for my son! 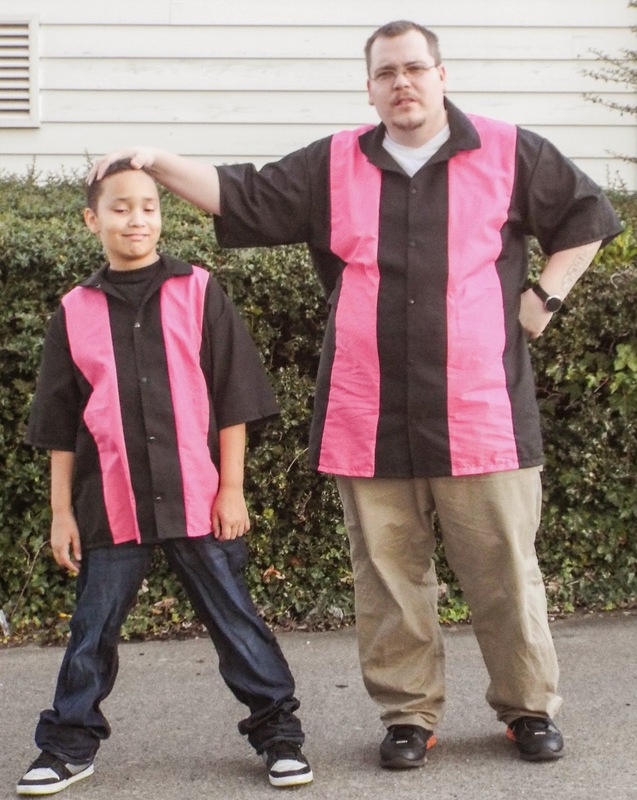 My 34 year old son's favorite dress shirt is pink. Love the message and your shirts! You did a great job. My son doesn't generally wear pink, because the one time he wore a pink polo he looked sickly. But I think that if I were to put a little pink into something that is a basic black, Navy or dark brown we could pull it off. My husband doesn't like pink, (or red for that matter) but he loves purple, any shade, so he proudly wears his purple polos to work, and his purple dress shirt under his Navy suit is smashing. My boys are little now but I am sure I am going to have that same problem soon!! 3 year old wears 5T tops and 10wk old wears 6M size!! Yay for big boys. Both your boys look fantastic! Well done! my 7yr old loves pink! Great pattern you used too, I've made many! Love it!! Love the graffiti! I think it is awesome that they both are wearing the pink! Well done. here is a weird historical FACT - up until the Victorian era male infants traditionally wore pink and females blue or yellow. I don't know why it changed. 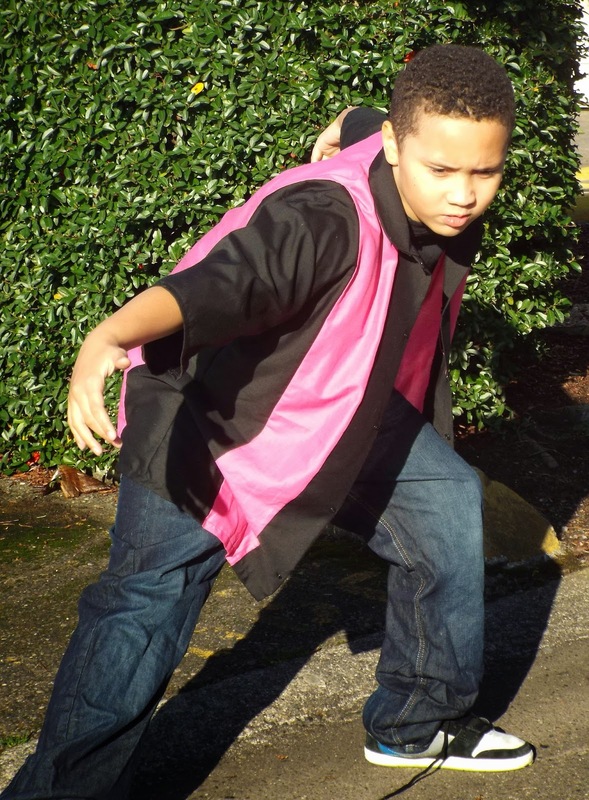 But its a sad indictment on our sexist culture that young boys fear being "feminised' if they wear pink. These jackets are great and your men look very manly!